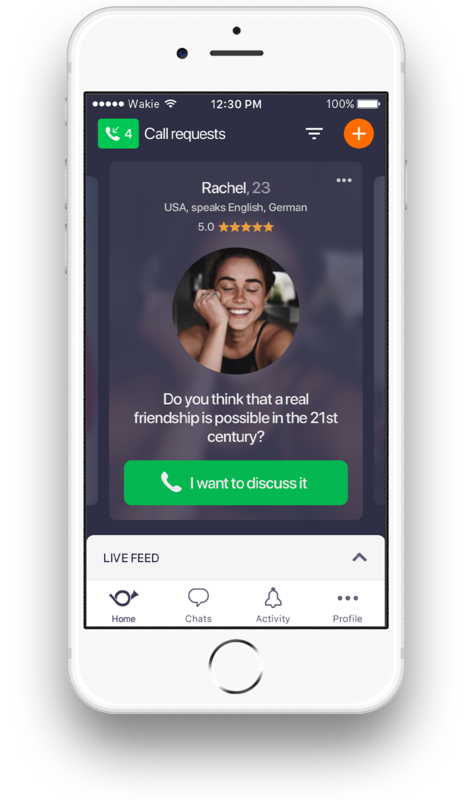 Connect with the right person for any question, moment or life situation. Wakie is a mobile app for phone calls. A community where you say what you want to talk about and get to have a phone call with interested person right away. Say, 'I want to practice Spanish with a native speaker' or 'I want to sing a song and get an honest feedback'. Books, news, cooking, parenting, business, love, and any other life issue you can think of — on Wakie, you can find someone to talk about it within seconds. Have a voice chat with a stranger. Pour your heart out and don't be afraid to express your true emotions. Wakie is a pseudonymous community and no one will judge you unlike almost any social media. When you open up and express your true self you click with someone who feels exactly the same and that is a great foundation to start a great friendship. 55% of older Wakie members say they found one or several real friends here. No judgement and no limits to share your emotions. Wakie is a pseudonymous community where we are free to set any nickname and express our true emotions. Sometimes good, sometimes not so good. True friendship is a rare thing nowadays. Being extremely open is rewarding because other people can relate to what you say and provide a sincere support. Wakie is your free world to get rid of boredom and have fun! Wakie is a platform where I found some true gems of my life and have them in my real life. It's a place where you could express what you really are and understand others also. Wakie is a place were you can talk about whatever thats on your mind. If you feel sad Wakie people will make you happy and etc. It is a community that never sleeps. I never feel alone anymore and it's a great feeling. Sometimes, it's easier to talk about certain things that bother you, with strangers than your closest friends. And wakie has some of the kindest strangers you'll ever meet. It could soon be bedtime for the snooze button. A fun idea which may just go viral. Wakie is quite fun. The community seems friendly. How To Talk To Strangers And Turn them Into Friends? And is it safe to talk to strangers? In this article we share our thoughts on talking to strangers in general and on Wakie app. Why should we talk to strangers? Because it makes us happier. A recent study at the University of Chicago found that sometimes we communicate better with strangers than friends and spouses. So please find ways to talk to strangers safely and be happy! In this doc we say what we are for and what we are against. Wakie is a global community of strangers who convert into friends through a meaningful conversation. We call our members Wakies, who represent a contre-culture of social media. Unlike social media users, we represent our true selves, not an imaginary person our 'friends' or followers want to see and like. When we like something, we tell it openly. Same if we dislike something. What we are for and what we are not? "The best way to cheer yourself up is to cheer someone else up"